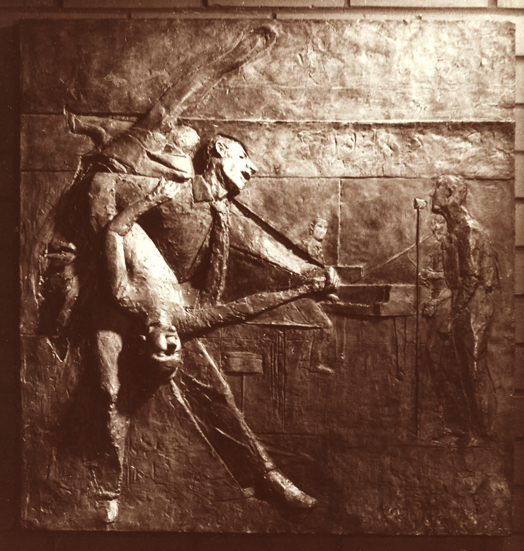 Bronze panel, height 91cm. Diane had made this relief, modelled in clay and cast into plaster, shortly before working for Runcorn DC. The rock and roll theme was developed for subsequent work initialy designed for gable ends on the Southgate estate in Runcorn. Move mouse to see the image of this work. The relief was modelled in clay by Diane and cast into GRC by BCM Whitchurch. It was based on Rock and Roll drawings that Diane made of dancers from Southgate. It was to have been part of a frieze that would have included imagery of Les and Tanneh Pendergast who featured in Paul McCartney's film Give My Regards to Broad Street. Local difficulties led to this work being installed in Padgate Library in Warrington. Southgate was demolished in the early ninties.